One of the best parts about the tattoo project is that I usually don't have to think that much. I grab some HP5 push it to 1600 and shoot away. One of the main reasons I did this was it was easy. Black and white film pushes easily, cheaply and it's way better under weird lighting conditions. Sometimes you need to mix it up though. 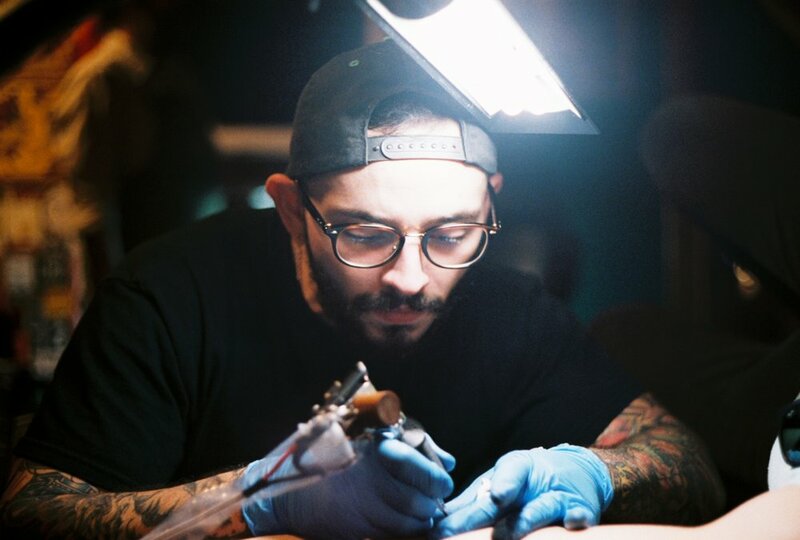 Friday the 13th is a special day for tattoo shops. When a Friday lands on 13 most people are worried about bad luck but in Austin it means you can get a great tattoo at a really low price. Shops will make special flash, pre-designed artwork, that they will tattoo at a prices below normal. People mark their calendars and come out in droves for it. It's like Black Friday for tattoos. I knew I would be shooting in the afternoon under normal indoor lighting conditions. At 1600 I'm typically at 1/125 and moving my aperture between F2.0 and F8.0. Indoors you don't have a lot of options, if it's really bad I'll push to 3200 and apologize to my film developer later. Most of the light I would be dealing with was fluorescent so I asked my film monger at Austin Camera what film stocks I should use. We decided on Cinestill 800T because I heard so many good things about it, but they warned that since I was shooting under flourescent light the images could be a little cool. They also recommended Fujiiflm Superia 1600 since flourescent was much closer to daylight and wouldn't need as much adjustment. It would also be a fun way to test out which one worked better. The Cinestill really surprised me. After color correction I really didn't notice any weird color shifts. The grain which can be an issue an higher speed was really pleasant and not distracting at all either. I always prefer a higher contrast negative and the Cinestill delivered here again. I had little to no adjustments to make in post. The only issue I had with the Cinestill was halation. The history on Cinestill is that it's Kodak motion picture film with the remjet removed. If the remjet layer is not removed it can cause havoc in the developing process. The Wright brothers have been working a long time on perfecting the remjet removal process. On a very weird side note, I knew them back in high school and only this year realized they were behind Cinestill, small world. The one downside of the removal of the remjet is that the film now suffers from halation, which looks like halos around lights. I saw a lot of it in my shots and while it didn't ruin anything it still looks a little weird. Superia 1600 on the other hand handled extremely well too. The grain and color here were great. The Superia 1600 colors overall felt a bit more warm and the grain was smoother as compared to the Cinestill. Having an extra stop is nice too, allowing me to increase my shutter speed and getting sharper images. I thought shooting color at night would be a pretty tough process but with the availability of Cinestill 800T and Superia 1600 you really have some great and affordable options. I give a very slight edge to Superia 1600 because it doesn't suffer from halation but I'm interested in pushing Cinestill a couple of stops and seeing how well it holds up. With whatever stock you choose it's nice to know you can get some usable images at night and that these films are still being made. If this review helped you please use these links to purchase Cinestill 800T and Superia 1600, this helps support this page and my work.